An exhibition at the Memorial Art Gallery is bringing new attention to an unconventional artist whose talent as an “outsider” went largely unnoticed during her life as a Rochester seamstress. 7 1/16 x 28 13/16 x 1/4 in. 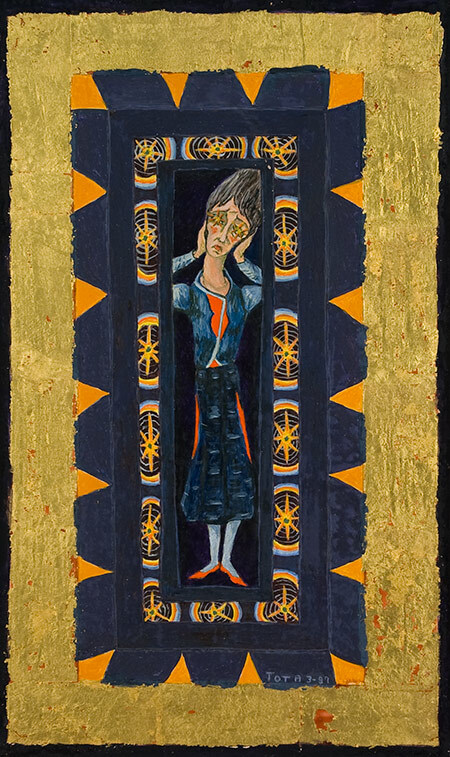 The Surreal Visions of Josephine Tota, which will be exhibited through September 9, brings together more than 90 of Tota’s paintings, about 20 of which are drawn from the museum’s collection and the rest on loan from family and friends. Imbued with themes of metamorphosis, family bonds, physical pain, human frailty, the natural world, loss, and tragedy, the work represents the “audacious and radical voice” of an artist almost lost to history, one who challenges commonly held assumptions about female artists working outside the mainstream. A seamstress and amateur artist who lived a conventional life among the Italian immigrant community in Rochester, Tota discovered the medium of egg tempera in her early 70s. Painting in the privacy of her home, she created a body of work that includes more than 90 small jewel-like paintings. In 1990, an exhibition in the Creative Workshop’s faculty and student exhibit space included more than 20 of her late paintings and a small group of ceramic figures and masks. That was the only time her late paintings were exhibited during her lifetime. The paintings were not available for sale and almost everything remained in the artist’s possession until her death in 1996. After the exhibition’s premiere at the Memorial Art Gallery, additional venues will be arranged by International Arts & Artists, a Washington, D.C.-based organization that promotes the arts internationally. In the context of unconventional artists developing their unique voices later in life, MAG curator Jess Marten will discuss Josephine Tota, and noted art historian Karal Ann Marling will discuss American folk artist Anna Mary Robertson Moses, best known by her nickname Grandma Moses. A panel discussion will follow, which will include Tota’s family members–daughter Rosamond Tota and great-niece Lisa Rosica. Larry Merrill will moderate, and questions from the audience will be welcomed. The talk will be included with museum admission.